One of the best things about fall is all the beautiful colors. Do you find yourself picking up gorgeous leaves as you walk through Central Park? Don’t throw them out! Here are 10 festive things to do with decorative leaves. One of the best things about fall is all the beautiful colors. Do you find yourself picking up gorgeous leaves as you walk through Central Park? Don’t throw them out! Here are 10 festive things to do with decorative leaves. Vibrant fall leaves are the perfect fall centerpiece. 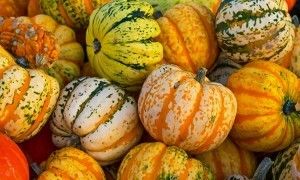 Do you have an autumn-colored plate? 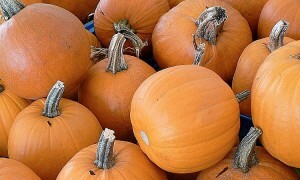 Top it with a white candle and surround it with leaves. You can also use few distinctive leaves to line a hurricane vase or fill a vase with boughs of leaves instead of flowers. Decorative leaves are ideal for decorating up a fireplace. String a few leaves together for a simple banner and drape it over your mantel. It only takes a few minutes, but the effect is fresh and pretty. Before your leaves dry out, use them to create colorful confetti. 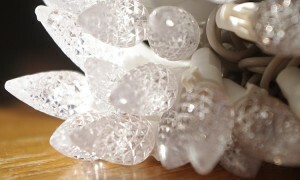 Use decorative punches to make fun shapes. The confetti can be used to decorate cards, make a mini bunting for a cake, or add a autumnal element to a party. Why spend a lot of money on decorations when beautiful leaves are free? 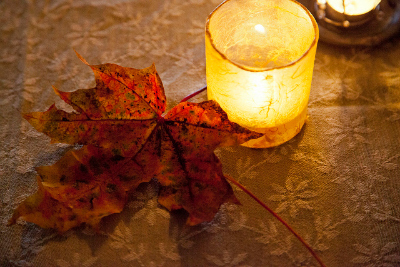 For your next party, collect big maple leaves to use as pretty place cards. They’ll make a huge statement on your table! 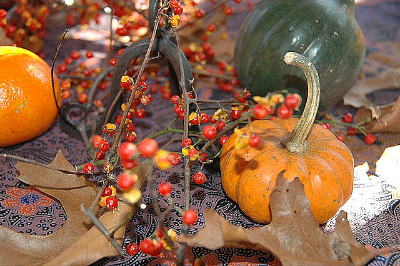 Continue the theme and cover your tabletop with leaves, berries, pumpkins, and other seasonal items to create a colorful table runner. Leaves make wonderful organic art. Try framing leaves in groups or individually. You can even paint the leaves (use traditional colors or get creative) and then print them on card stock. Another option is to use a leaf as a stencil. Start by painting a canvas any color you wish. Let the paint dry, then lay a leaf over the canvas. Finally, go over everything with gold spray paint. Remove the leaf, and you’re left with a gorgeous piece of art! Autumn wreaths use pretty leaves to their best advantage. 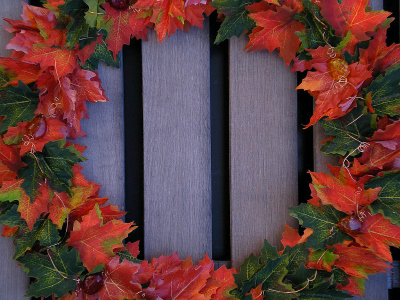 First, gather a lot of leaves and pick up a wreath form at your local craft store. Attach the leaves to the form using floral wire. Overlap the leaves as you go so the wire doesn’t show. Create your own linens that you’ll use year after year. Funtober has an easy tutorial. This seasonal print would look beautiful on a tablecloth, dish towels, or even an apron. Why not surprise someone with a handmade card? Simply attach a pretty leaf to a plain card with some glue. You could even create a set to give as a gift. Kids love playing with leaves, so get them involved! Create leaf animals by gluing the leaves to plain paper and then painting on legs, eyes, and other fun details. Try painting on the leaves and creating leaf prints, too. Celebrate fall by making leaf crowns. Attach leaves to construction paper rings with tape, glue, or a stapler. It’s easy and fun! Don’t just throw out those leaves at the end of the season. WikiHow has six ways to preserve fall leaves. 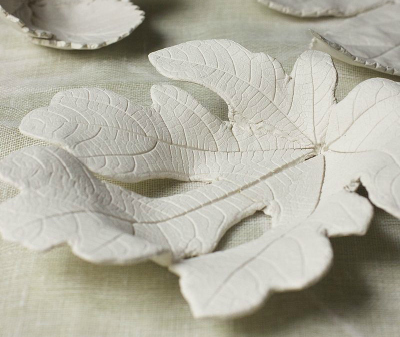 For something unique, try making a clay leaf bowl. Decorative leaves are the perfect way to add a sesonal touch to your New York apartment. Try one of these ideas today!